Reza received the honorary degree of “Doctor Honoris Causa” in Humane Letters from AUP for his achievements in the field of journalism and humanitarian work. 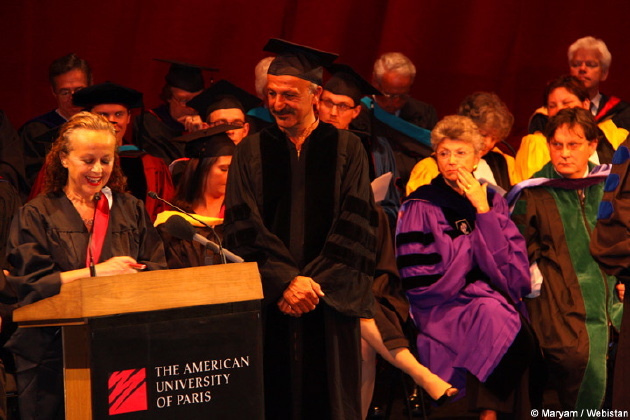 On Monday May 25, 2009, Iranian-French photojournalist and humanitarian, Reza Deghati received the honorary degree of “Doctor Honoris Causa” in Humane Letters from the American University of Paris (AUP) for his achievements in the fields of journalism and humanitarian work. The award was presented by Celeste Schenck, the president of AUP. This honorary degree has been attributed to renowned scholars, artists, writers, reserchers and political figures every year since 1984. Past recipients include Gene Kelly, Bernard Kouchner, James Ivory, and the Burmese opponent and 1991 nobel prize winner, Aung San Suu Kyi. “Born at Tabriz, in Iran, town of intellectuals and mystic poets, you could not make up your mind between being an architect and a photographer, between being a builder and a witness, so to speak. I should say, Reza, that during your all life, you have not chosen between the two options, but you remain both : the humanitarian going along with thousands of civilian victims of conflicts, refugees, children and women forced to exile, showing the terrible consequences of war for humanity. You are not only a war photographer, because your pictures demonstrate a big sympathy for the victims. You rarely show corpses or soldiers, except when they are soldier children, and when you take a photograph of dead people, this photograph becomes the icon of human suffering. The greatest pictures you took, Reza, are universal. Your pictures, Reza, encourage us to question the ambiguous meaning of civilization. They are not meant to shock, they are food for thought. This year’s other honorary degree recipients were Christine Lagarde, French minister of finance and economy, Naïf Abdullah Al-Rukaibi, secretary of State of Public Affairs of Kuwait and the French-American actress Leslie Caron.